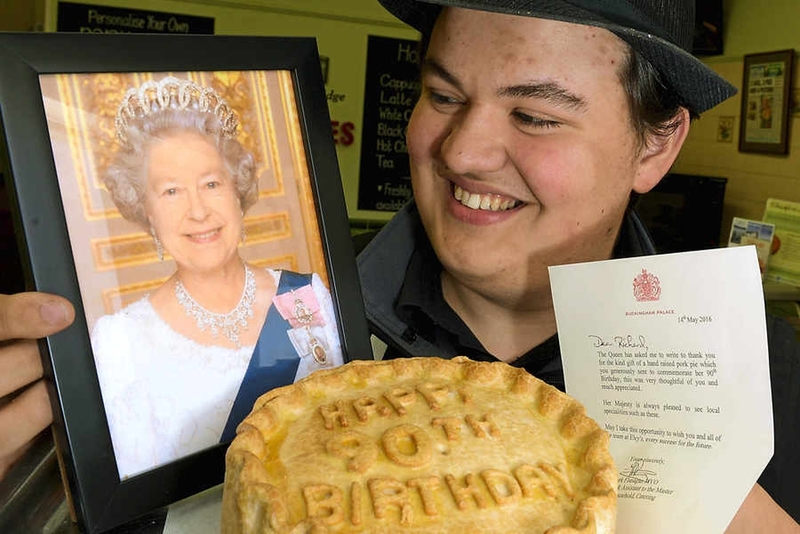 Here’s a butcher’s way to wish the Queen a happy birthday –with a giant pork pie. A family run shop in Ironbridge sent the treat to Buckingham Palace to mark Her Majesty’s 90th. And this week Eleys of Ironbridge received a letter from the Queen thanking them for their “unique” gift. This is the second time the shop has sent a member of the Royal Family a special pork pie, as The Duke and Duchess of Cambridge had one for their wedding in 2011. On the new pie the crust said “HM Queen 90th Elizabeth” and the Palace wrote back saying she enjoys trying different dishes from across the UK. Tom Eley, one of the butchers at the shop, says they often make birthday pork pies, but it was special making one for The Queen. The 18-year-old said: “We make a lot of pork pies at the shop throughout the year for birthdays and celebrations. “We made one of these giant pork pies for the Royal Wedding, for when Prince William and Kate for married, so we thought we’d make one for the Queen’s birthday. We sent it down and we got a letter back from the Palace saying the Queen loves getting gifts from people around the country. “It says that she loves trying different dishes from around the UK and that she will be enjoying it this weekend. “We just thought we would send The Queen a unique gift and I don’t think you can get more unique than a pork pie. “But we have been making pork pies for the local area for 50-years and my father, Tim runs the shop and my brother Richard and I help.